This is a light and breezy book about the small joys of life, from gardens to books to sweaters to tea time. Even if one doesn’t share the same passions, DeBlassie writes with such verve that dear reader feels the warm fuzzies. If all is not going well, a chapter from this lovely book could help reframe the day. 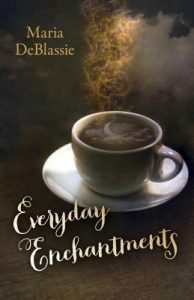 I was fortunate to receive a digital copy from the publisher through NetGalley of this book that reminds us that the small things matter, and that we choose how we view our world.